Bishop of the Diocese of Kaduna Church of Nigeria (Anglican Communion), Right Reverend Timothy Yahaya, on Friday commended President Mohammadu Buhari on his success against insurgency we’d ongoing war against corruption in the country. He said he stands with the federal government on the war because corruption is a cancer that has eaten the nation’s in all directions of her national life. He however WARNED that the war should be seen to be fair to all, quickly added that anything short of that is political witch hunt and corruption itself. Speaking at the opening of second session of the 20th Synod, themed; “Righteousness Exalts… ” taking from the Book of Proverbs 14:35a, held at St Christopher’s Anglican Church, Sokoto road, Kaduna, North-west Nigeria, the Anglican Bishop commended security agencies for putting up a gallant fights against insecurity in the country. HE expressed WORRY over untamed incessant killings traced to Fulani herdsmen and establishment of grazing reserves for only a section of the people of the country who are doing their business and proceeds go to their pocket and not that of all Nigerians; people pay for meat they buy from these people and I see no reason why they should be given a preferential treatments over other Nigerians. 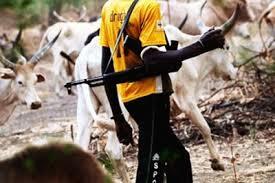 “The cows are the private business of the Fulani man. Creating a special class of people, given them preferential treatment, will not fair to all Nigerians. No laws in Nigeria are passed to protect a particular tribe and it’s business; all laws must be seen to be fair to all. “Passing a grazing bill will only mean some people and their businesses are more important than other. Why is the Petroleum Bill still hanging in spite of the fact that the oil sector is the back bone of our economy? he asked. He then SUGGESTED that Federal and state governments should advise Fulani herdsmen to create ranches, or the government go to their loyalties to create ranches and rent them out to the herdsmen. “All over the world today, ranches are the best and civilized way of keeping cattle. It has the advantage of making the herdsmen stay in one locality to give their children education. He asked again, “whose land do you want to take and please who? Population has grown, land is very scarce and precious to every community. Synop therefore advised the government to drop the idea of grazing reserves as this will create more problems than solution”, he added.